Scribbling in the margins — Jg. I've never been the sort to write in my books. Until recently, I never quite understood the motivation to do so. Pick up a used book, and now and then you'll find something perplexing written on its pages. That's Laura Lippman's And When She Was Good above, the final page of which bears something that might be a shopping list, or a reading list, or goodness knows what. "Garnish - gamer; boom - boon; Judaism - cherubs; life insurance; Sister Carrie." It might be answers to someone's security questions for an online bank. Maybe they're password hints. I decided to give it a try. I'd read Austin Kleon's Show Your Work recently, then picked up a copy of Steal Like an Artist. While reading the latter, I took a pencil in hand and marked up things that captured my attention. Pencil marks weren't enough, I thought, so I tagged each page I marked with a Post-it note. Within just a few minutes of reading with my pencil and Post-its handy, I'd gathered a stock of interesting ideas from the book, some of which might eventually turn into blog posts—like this one—or which might just prove handy to me in my own daily work. Writing in this book brought me back to my childhood. I'd completely forgotten the common practice of marking up Bibles. 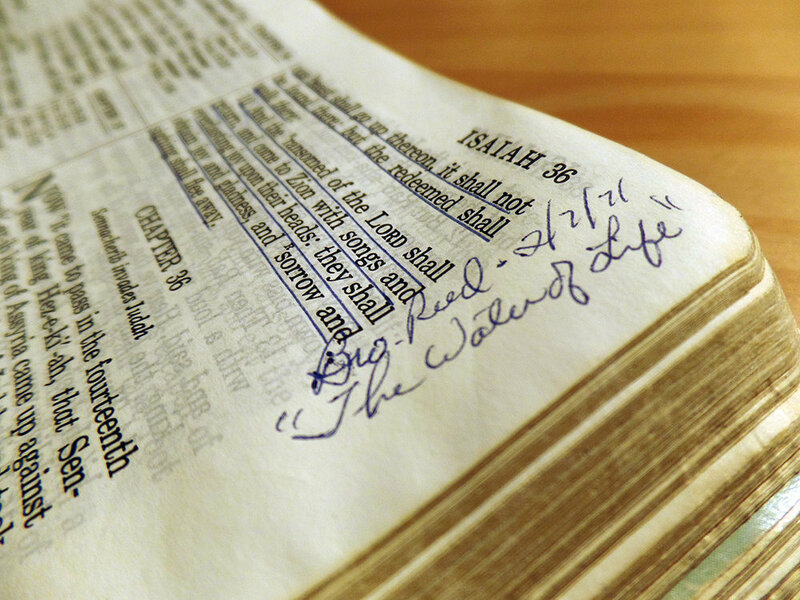 My father, a minister for most of my life, still has Bibles from his own childhood, and dozens, if not more, from his adult life. They're all blanketed in scribbles and notes. 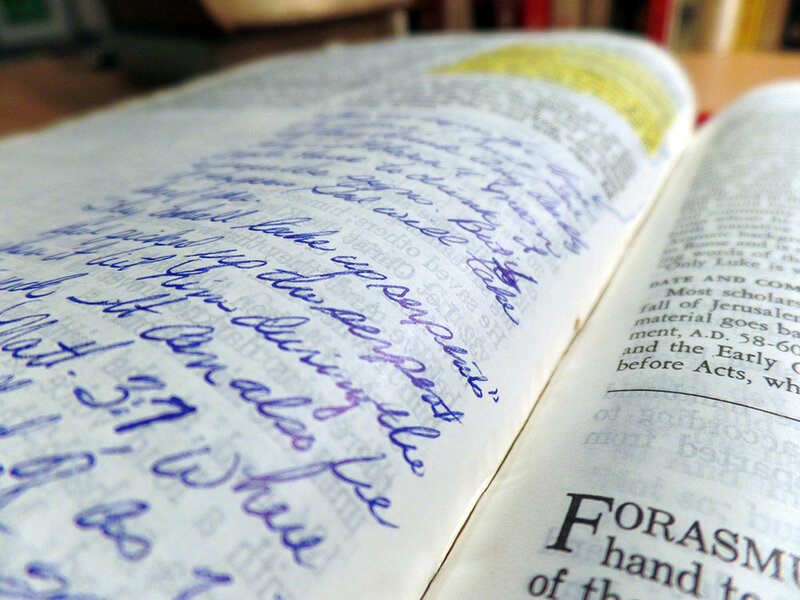 My grandmother's Bible is filled with memorable dates and events in her family's life. Years ago, perhaps hoping to jar me back into the spiritual fold, my parents gave me their own Bibles, the ones I recall from my own childhood. They're filled with notes. My father’s Bible, a gift from his family seven years before I was born. He wrote all over its pages—notes from sermons he’d heard, perhaps ideas of his own. 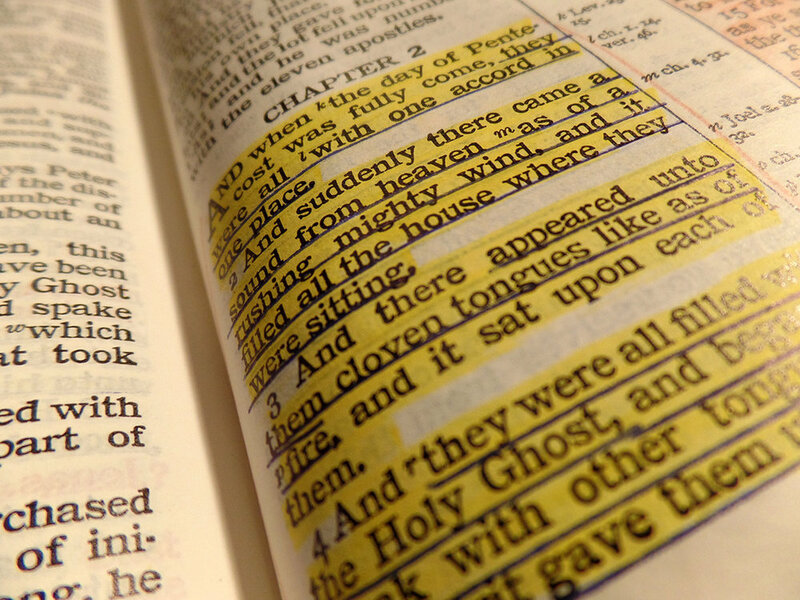 He logged the source text of each sermon he heard, along with the date and speaker. My mother’s Bible included sentimental notes like this one, documenting a Crayola scribble I’d rendered on the cover at a year old. Lots of highlighting and underlining in her Bible. I also have my own childhood Bible. This is the inside cover, stabbed full of holes. I don’t remember doing this, but there’s a metaphor here, probably. My own childhood marginalia often represented itself in futile demands that I read the damned thing. I can't say I'll take up the practice with novels. But I've a whole stack of writing craft books that I've read over the years, and I often go digging through them looking for something useful. I think I'll read those with a pencil and some Post-its, for sure. I'm not a Field Notes aficionado, but their motto seems particularly apt: I’m not writing it down to remember it later, I’m writing it down to remember it now. And though the Bibles are going back on the shelf, I can't help but imagine my daughter prowling through my books someday the way I've flipped through those old Bibles, discovering moments in my history that she wasn't privy to, things I thought about, texts I got lost within, getting to know me just a little better—and seeing those books in an entirely different light. Maybe she'll even add some notes of her own.